Aravindha Sametha, NTR and Trivikram’s most eagerly awaited high-budget entertainer, is gearing up for a grand Dasara release. The film’s shoot is underway in Hyderabad and the team has already wrapped up nearly 40 percent of the production formalities. 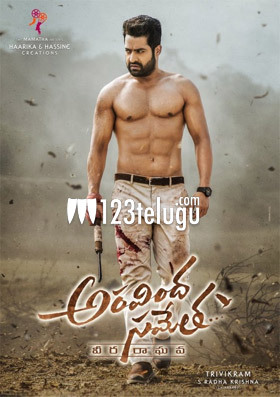 The latest update is that Aravindha Sametha’s dubbing formalities have begun this morning with a formal puja ceremony at Sabdalaya Theatre. Comedian Srinivasareddy began dubbing for his role and more actors will lend their voice from next week. Pooja Hegde is the leading lady and Jagapathi Babu and Naga Babu play the heads of two faction groups in the movie. S Radhakrishna is producing the movie. Thaman is the film’s music composer.